In 1913 my grandfather worked for the U.S. Forest Service in Salmon, Idaho. I have his photo album with a picture showing fishermen in “downtown” Salmon over 800 miles from the Pacific, holding salmon over 3’ long. Creeks ran thick with spawning salmon – an estimated 4 million salmon and steelhead returned to Idaho each year. As an Easterner come West, imagine the sense of wonder he must have felt. Born in high-mountain streams, traveling downriver to live most of thei lives in the ocean, and then swimming as far as 900 miles upriver to reproduce at the place of the birth, these anadromous fish are the subject of legends, history and poetry. Today, my grandfather’s great grandchildren would be lucky to see a handful of salmon in Idaho. Every native run of salmon and steelhead in the Snake River basin is either already extinct or listed under the Endangered Species Act. These listed runs will become extinct very soon if a new course of action isn’t taken. The main reason for the demise of Idaho’s fish is clear – dams. The Columbia and Snake rivers have dozens of dams, including some very important hydroelectric producing dams on the Columbia. In the 1960’s and 70’s four dams were built on the lower Snake River, and since the completion of the last one in 1975, Idaho’s wild salmon and steelhead runs have crashed by nearly 90%. While the dams do have fish ladders to assist the fish in upstream migration, the biggest death toll comes when they are traveling downstream to the sea. Scientists estimate that over 80% of smolts (the young fish) are killed as they pass through the dams’ turbines and warm, predator-laden reservoirs. For the past 40+ years the Army Corps of Engineers ahs tried to solve this problem by removing smolts from the river and sending them to the ocean in barges and trucks. Sadly, billions of dollars have been spent, yet the program has failed to halt the decline of salmon and steelhead runs. What was once a thriving and natural ecosystem is now a welfare state of fish subsidies that is not working. What’s the answer? Independent scientific studies confirm that Idaho’s ocean-going fish runs need a more natural, free-flowing river to survive. We don’t need to destroy the lower Snake River dams to get our fish back, we just need to remove the earthen portion of the dams so the river can flow around them. If necessary, the dams could be made operational again by putting the earth fill back in place. Once the dams are bypassed, scientists say there is an 80-100% chance that salmon runs can be restored to pre-dam levels within 15-24 years. That would mean over 100,000 big, beautiful, wild salmon and steelhead returning to the Snake, Salmon and Clearwater rivers every year. Where dams have been removed (the Elwah in Washington State, the Penobscot in Maine, etc.) the recovery of salmon has been dramatic. These four dams on the lower Snake produce less than 5% of the entire Northwest grid of energy and the impact of removing them in terms of jobs and agriculture can easily be mitigated. In the end it would save taxpayer money because now we are subsidizing the dams’ operations and spending millions on trying to keep the fish from going extinct as required under the Endangered Species Act. There is much to learn about this issue and we encourage you to visit Idaho Rivers United and Save Our Salmon. 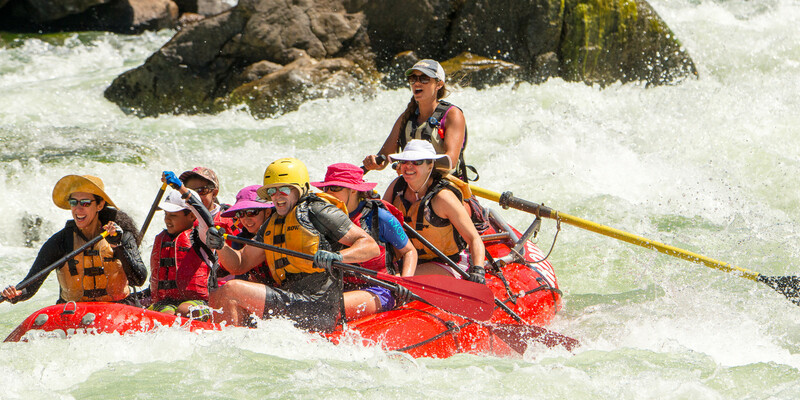 When you go on a river trip with ROW Adventures, you have an opportunity to help save the rivers and fish with our voluntary river preservation “pass-through” program that you can learn about here. The life of the salmon to you! We look forward to sharing more with you and hearing your thoughts.